After a very long wait, Game of Thrones is back and BETTER THAN EVER. The following contains spoilers for the Season 7 premiere as well as the preview for episode 2, so unless you want to be as surprised as Robb Stark at a Frey Wedding, turn around and head back North. Unlike the Season 6 finale “The Winds of Winter,” the Season 7 premiere, “Dragonstone,” may not have left us with our jaws on the floor for days, but it does what most GoT season premieres do best: Set up for a brilliant and chaotic season. Cersei is settling to her place on the Iron Throne, Jon and Sansa are bickering over the best way to rule the North, Arya got some *serious* revenge on the Freys, Bran had a vision, and Daenerys and company FINALLY reached Westeros. *With some very key exceptions (looking at you NYMERIA!). For the previous six seasons, Dany was a non-issue for those looking to claim the Iron Throne, seeing as how she was far away in Essos with no “real” means to invade Westeros. Now, of course, she has not only *arrived*, but she’s come stacked with allies. Naturally, this has everyone talking. Longtime Arryn bannerman Yohn Royce — who is allied with the Starks due to Littlefinger’s role as Lord Protector of The Vale — does not like the idea of casually saying “Hey” to Dany. We get the feeling that Ser Davos (and Jon) will disagree, and Dany and her (unknown) nephew will probably meet. Look for Littlefinger-induced drama ahead. This is definitely a “pot, meet kettle” statement coming from the woman who literally killed a ton of people AND destroyed the Sept of Baelor with wildfire, like, a second ago. We think it’s safe to say that Cersei and Dany will NOT become BFFs this season. Plus the whole Jamie = Kingslayer thing might be awkward. While we’re at it, her war room has more major players than a Met Ball bathroom. 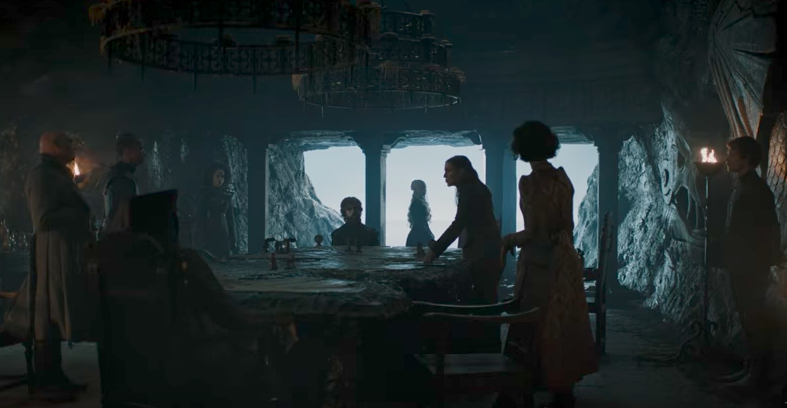 We have *deep breath* the OG council in Missandei and Grey Worm, Hand of the Queen Tyrion Lannister, the shifty but mostly-all-knowing Varys, vengeful siblings Yara and Theon Greyjoy, Ellaria Sand, AND Lady Olenna Tyrell. 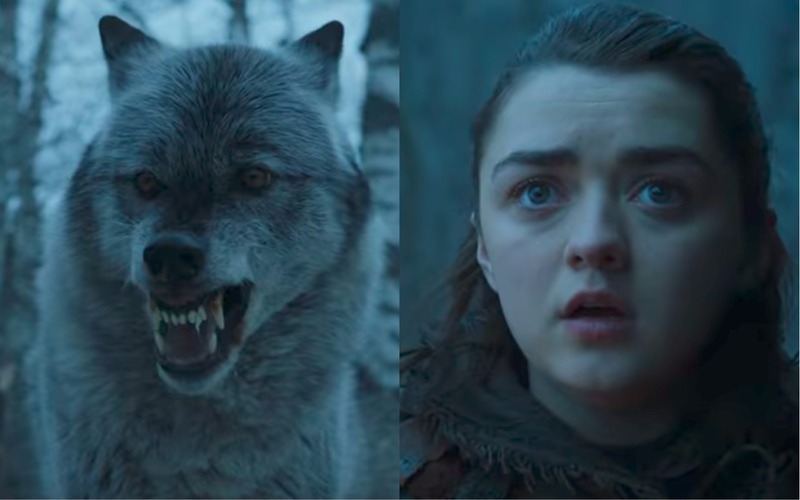 But that’s not the only power reunion for the episode, as Nymeria and Arya will meet once again. And guys, that’s just TWENTY seconds. Imagine what the whole episode will be like. Take a deep breath (or not, because we seriously can’t after “Dragonstone”), and prepare for “Stormborn,” because Game of Thrones (and Winter) is here and it is back with a vengeance.